This one looks orange-red in the tube but when swatched, it's actually a nice sparkly orange-coral shade. I actually didn't expect it to be this sparkly. Hahaha, stupid me. Hello??? ColorBliss "Sparkles" lipstick? Here's a close-up of the lipstick. See the sparkles? Here's another one where the sparkles are more obvious. The one on the right is Candy Twinkle. It goes on sheer but the color is buildable. I, for one, am not a fan of sheer lippies. I don't like piling on layer after layer and end up with lipstick settling on the lines of my lips. Here's what it looks like on my lips. The sparkly finish is not quite obvious in the pics but it really is in real life. The sparkles are not that obvious in the pics. 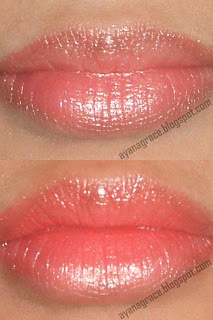 Too sheer for my taste but it does give my lips a hint of coral. It also doesn't settle on the lines of my lips even after several coats, which is a good thing. It easily transfers but when I don't eat or drink too much, I get 4-5 hours of wear with this one. The shade is really nice. Glides on smoothly on the lips. Doesn't settle on the lip lines. For a sheer lipstick, it has decent staying power if you just let it be - no drinking, eating or kissing anything/anyone (?). Packaging is "simply pretty." Really simple but not cheap-looking. The shade can be found at the bottom of the tube. Inexpensive, priced at 130 Php for 4 g of product. Too sheer for my taste. Takes me more than 3 coats to get the color I want. The sparkles don't come off as easily as the color does. I get sparkly all over - around my lips, my cheeks, my jawline... But is that really a bad thing? Haha! What do you think about this lippy? i love the color of the lipstick <3 its very pretty!! Very pretty! :) I'm loving the shade! Orange lips are actually a huge thing! :) Nice buy! I love Avon Lipstick! most of my lipsticks i purchased from Avon.. but i don't have any simple pretty lines though.. i should try it now.. i love how that lipstick doesn't dry up your lips! The lipstick looked a little scary at first, like really bright orange. But I think it looks beautiful on you! 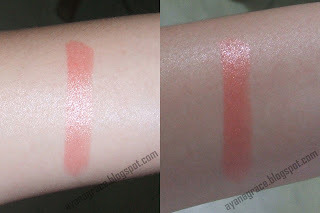 Love coral lipsticks :) I'll think twice when dismissing orange toned lippies now!